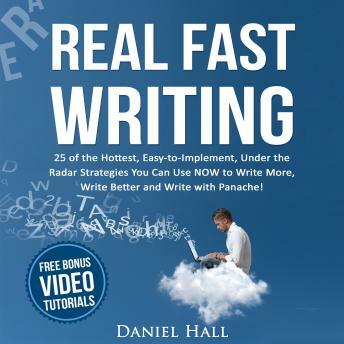 The goal of this book is simple: Help you write faster and at a higher quality. Let's face it, if you're in business for yourself -- an author, speaker or trainer, coach, consultant or entrepreneur or if you realize the great need for large quantities of fantastic content fast -- then you need to know how to speed write. It goes without saying that if you're a writer or publisher and you can already crank out content at a brisk clip, even a small increase in production can give you a slight edge. Add a percentage point more production with one tactic here and another percentage point with another strategy there, and you do that consistently over time you can significantly increase your overall writing production. Fact is, this book contains all of the strategies I've learned, developed or innovated to do exactly that: write at lightning fast speed. By the way, the techniques I cover can be applied - almost universally - to any type of content you need. You can use these methods to quickly write books, blog posts, emails, letters, scripts, articles, essays, white papers, reports, sales copy, social media posts, fiction or non-fiction. If you need to get more quality words on a page faster... you found your resource!